The Customer acknowledges having read and understood, previous to reservation, the entirety of the following information and the dimension of the operation of the present general terms and conditions. The Customer also acknowledges having the capacity to close this contract. This Prepayment Confirmation is subject to the present general terms and conditions. If the Customer does not agree to these Terms, and refuses them de facto, he/she will then have to interrupt the reservation process. Otherwise, the Customer acknowledges having read and understood these Terms and agrees to be bound by them. Contract "inter absentes" /online contract: defines the reservation of services closed online by the Customer with EUROPCAR MAROC who, for this contract, uses exclusively the internet and the securing services until the establishment of the car rental contract realised by the delivery of the service booked and prepaid. "Reservation " : action by means of which the Customer acknowledges to rent the services booked from EUROPCAR MAROC who, if necessary, will proceed to the delivery. "Confirmation of prepaid reservation ": document indicating the services reserved by the Customer, who must be signed by him/her by means of an online validation click in order to retain it; such document will then have to be edited to be presented at the car delivery station. a) the credit card used to make prepayment and whose identity will have to be identical to the one on the driver's licence, passport or ID mentioned at the time of reservation. b) a valid and accepted means of solvency (credit card) for the non-redeemable excess charge. c) the 'Confirmation of prepaid reservation' document. In the event of non availability of the vehicle booked, you will be provided with a vehicle with similar characteristics or of higher category. The rental period is calculated on 24-hour periods commencing at the time of pick up. If the vehicle is kept longer than specified, additional day charges will apply, at the current public rate, after a 59-minute grace period. Prepaid rates are indicated in Moroccan Dirham. These rates are strictly non-discountable and cannot be combined with any other promotional offer. A valid major credit card must be presented to the Europcar rental counter at time of pick-up to cover any additional anticipated charges not covered by the prepayment amount, as well as the amount of the security deposit. An authorisation from the bank is required at time of rental and only on return of the vehicle will the corresponding charges be posted to the credit card. A non redeemable excess charge may apply if the vehicle is stolen or damaged, for whatever reason, even if collision damage and/or theft waiver has been purchased or is included in the rental charges. the issue of a new reservation where the tariffs and availability stated at the time of request of amendment apply. if the reservation is cancelled 24 hours before the start of the rental period, no refund will be due. - if the reservation is cancelled 24 hours before the start of the rental period, no refund will be due. If the driver fails to collect the vehicle on the rental start date, if he/she has failed to notify Europcar Maroc by writing in advance of this date as mentioned in articles 7 and 8, in the event of “no -show”, if the customer fails to present the documents mentioned in article 3; in all such cases no refunds in full of his prepaid reservation shall be given to the customer; No refund will be made. If there is no amendment to the reservation, no refund will be due for rentals shorter than the duration stipulated on the reservation, in the event of late arrivals when picking up the vehicle and if customer fails to pick up the vehicle at the due rental start time. 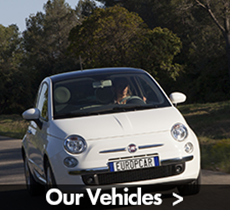 Fitness to drive: the driver must be aged 23 or over and have a valid driver licence in effect at least two years prior to the rental start date and present it to the Europcar rental counter at the commencement of the rental. A valid credit card must be presented at time of rental as provided in article 3 above. Failing to fulfil these requirements will result in the reservation being regarded as cancelled at the time of delivery and there will be no refund in full of the prepayment; in this case, article 9 applies. RENTALS ARE SUBJECT TO THE GENERAL TERMS AND CONDITIONS OF THE EUROPCAR MAROC RENTAL CONTRACT, IN EFFECT AT THE TIME OF THE CLOSING OF SUCH RENTAL CONTRACT. See general rental terms and conditions. The exclusion of certain warranties or the limitation or exclusion of liability for incidental or consequential damages, some of the above limitations set out in this article may not apply. In particular, nothing in these terms and conditions shall affect the statutory rights of any consumer or exclude or restrict any liability. You expressly acknowledge and agree that EUROPCAR MAROC, its officers, directors, employees shall not be liable for any indirect, damages such as damages for loss of profits, customers, data or other intangible losses (even if EUROPCAR had been advised of the possibility of such damages), resulting from the online booking and prepayment. Any information required from the Customer at the time of reservation is necessary to the treatment of his/her booking; this information will not be used for commercial purposes by EUROPCAR MAROC or by the secure system. The computerised files, kept in the EUROPCAR computer systems in reasonable security conditions, are regarded as proofs of communications, orders, reservations, rental conditions and payments that have taken place between the two parties. Will be submitted to the laws in force in Morocco and the competence will be given to the courts of Casablanca.